Catherine, Duchess of Cambridge (Catherine Elizabeth "Kate"; née Middleton; born 9 January 1982) is the wife of Prince William, Duke of Cambridge. The Duke of Cambridge is second in line to the thrones of the sixteen Commonwealth realms and, should he eventually become king (as is expected), she would automatically become his queen consort.Catherine grew up in Chapel Row at Bucklebury, a village near Newbury, Berkshire, England. She studied in Scotland at the University of St Andrews, where she met the then Prince William of Wales in 2001. They started a romantic relationship and, once it became public, she received widespread media attention and there was much speculation that she and Prince William would eventually marry. During a break-up lasting for several months in 2007, they continued to be friends and then rekindled their relationship later that year. Their engagement was announced on 16 November 2010, and Kate Middleton attended many high-profile royal events before they married on 29 April 2011 at Westminster Abbey. Catherine Middleton was born at Royal Berkshire Hospital in Reading on 9 January 1982 and christened at St Andrew's Bradfield, Berkshire on 20 June 1982. :32 She is the eldest of three children born to Carole Middleton (née Goldsmith), a former flight attendant and now part-owner of Party Pieces, a private company with an estimated worth of £30 million,and Michael Middleton, who also worked as a flight attendant prior to becoming a flight dispatcher for British Airways, currently also an owner of Party Pieces. Her parents married on 21 June 1980, at the Parish Church of Dorney, Buckinghamshire, and in 1987, founded Party Pieces, a mail order company that sells party supplies and decorations. Kate Middleton has a younger sister, Pippa and a younger brother, James Middleton. The family has complained about press harassment of Pippa and their mother since Kate's engagement. 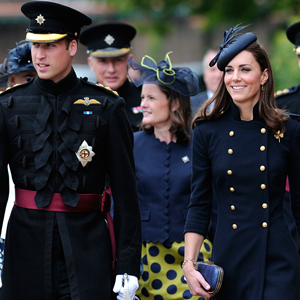 Kate Middleton's paternal ancestors were from Leeds, West Riding of Yorkshire. Her paternal great-grandmother Olivia was a member of the Lupton family, who were active for generations in Leeds in commercial and municipal work. Her ancestors include the Revd Thomas Davis, a Church of England hymn-writer. Carole Middleton's maternal family, the Harrisons, were working class labourers and miners from Sunderland and County Durham. 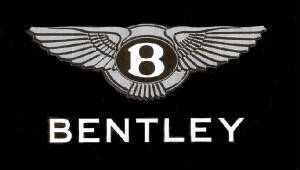 Kate Middleton's parents worked for British Airways in Amman, Jordan from May 1984 to September 1986. 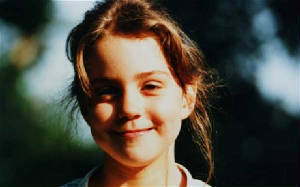 In Jordan, Middleton went to an English language nursery school before returning to their home in Berkshire. After her return from Amman, Kate was enrolled at St Andrew's School near the village of Pangbourne in Berkshire, then briefly at Downe House. She attended Marlborough College, a co-educational independent boarding school in Wiltshire, and graduated from the University of St. Andrews in Fife, Scotland with an undergraduate MA (2:1 Hons) in the History of Art. While a student at St. Andrews, she met Prince William. 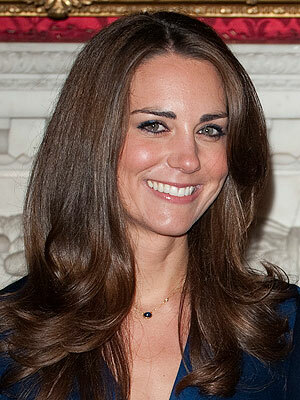 In November 2006, Kate Middleton accepted a position as an accessory buyer with the clothing chain Jigsaw. She also worked part-time until January 2011 as a catalogue photographer, webpage designer and marketing officer for her parents' firm "Party Pieces". In 2008, it was reported that she had quit her job at Jigsaw to become a professional photographer, intending to take private classes with photographer Mario Testino, who had taken several well-known photographs of Diana, Princess of Wales and her sons. Testino later denied that Kate was going to be working for him. Catherine is admired for her fashion sense and has been placed on numerous "best dressed" lists. She was selected by The Daily Telegraph as the "Most Promising Newcomer" in its 2006 list of style winners and losers. Tatler placed her at number 8 on its yearly listing of the top ten style icons in 2007. She was featured in People magazine's 2007 and 2010 best-dressed lists. Kate was named as one of Richard Blackwell's ten "Fabulous Fashion Independents" of 2007. In June 2008, Style.com selected Middleton as its monthly beauty icon. In July 2008, Middleton was included in Vanity Fair's international best-dressed list. In February 2011, she was named the Top Fashion Buzzword of the 2011 season by the Global Language Monitor. The Duchess is known for mixing couture pieces, often by British designers, with 'High Street' retail fashion. Designers worn by the Duchess include Sarah Burton at Alexander McQueen, Issa, Jenny Packham, Beulah London, Alice Temperley, Erdem and Catherine Walker; high street labels worn by the Duchess include Reiss, Zara and L.K.Bennett. In January 2012, she was voted 'Headwear Person of the Year'. Kate's status as the undeclared girlfriend of Prince William brought her widespread media coverage in Britain and abroad and she was often photographed on her daily outings. On 17 October 2005, she complained through her lawyer about harassment from the media, stating that she had done nothing significant to warrant such publicity. In February 2006, it was announced that Kate Middleton would receive her own 24-hour security detail supplied by the Royalty Protection branch (SO14). This fuelled further speculation that she and Prince William would soon be engaged, since she would not otherwise be entitled to this service. No engagement was forthcoming and Kate was not granted an allowance to fund this security. Media attention increased around the time of her 25th birthday in January 2007, prompting warnings from both The Prince of Wales and Prince William and from Kate Middleton's lawyers, who threatened legal action. Two newspaper groups, News International, which publishes The Times and The Sun, and the Guardian Media Group, publishers of The Guardian, decided to refrain from publishing paparazzi photographs of her. 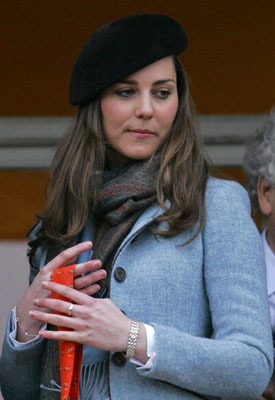 Kate attended at least one event as an official royal guest, Prince William's Passing Out Parade at the Royal Military Academy Sandhurst on 15 December 2006. In December 2007, it was reported that she had moved in with Prince William at Clarence House, the residence of the Prince of Wales in London. Clarence House later denied this. On 17 May 2008, Kate attended the wedding of Prince William's cousin Peter Phillips to Autumn Kelly, which the prince did not attend. On 19 July 2008, she was a guest at the wedding of Lady Rose Windsor and George Gilman. Prince William was away on military operations in the Caribbean, serving aboard the HMS Iron Duke. In 2010, Kate pursued an invasion of privacy claim against two agencies and photographer Niraj Tanna, who took pictures of her over Christmas 2009. She obtained a public apology, £5,000 in damages, and legal costs. On 14 April 2007, The Sun newspaper broke a "world exclusive" suggesting that Prince William and Kate Middleton had split up. Other media outlets, such as the BBC, confirmed the story as the day progressed. The couple decided to break up during a holiday in the Swiss resort of Zermatt. Clarence House made only one comment about the relationship's end, according to The Times, stating, "We don't comment on Prince William's private life". Newspapers speculated about the reasons for the split, although these reports relied on anonymous sources. The original report in The Sun quoted a "close friend of the couple" as saying that Middleton felt Prince William had not been paying her enough attention. The paper highlighted reports that Prince William had been spending time with other young women and said the Prince, aged 24 at the time of the split, felt he was too young to marry. A report in the Daily Mail blamed a desire by royal courtiers not to "hurry along" a marriage announcement, and Prince William's desire to enjoy his bachelor status within his Army career. The Mail also suggested that a friend of Prince William encouraged the Prince to take a "careless approach" to relationships. The same article suggested that Middleton had "expected too much" in wanting Prince William to demonstrate his commitment to her. In June 2007, Kate Middleton and Prince William insisted they were "just good friends" following reports of a reconciliation. Middleton and her family attended the Concert for Diana at Wembley Stadium, where she and Prince William sat two rows apart. The couple were subsequently seen together in public on a number of occasions and several news sources, including the BBC and the Daily Mail, stated that they had "rekindled their relationship". She also joined Prince William and The Prince of Wales on a deerstalking expedition at Balmoral and attended the wedding of Prince William's cousin, Peter Phillips, even though Prince William, due to a prior commitment, did not. In April 2008, Kate accompanied Prince William when he was awarded his RAF wings at the Royal Air Force College Cranwell. On 16 June 2008, she attended Prince William's investiture into the Order of the Garter, along with the Royal Family. Prince William and Catherine Middleton became engaged in October 2010 in Kenya, East Africa, during a 10-day trip to the Lewa Wildlife Conservancy to celebrate Prince William passing his RAF helicopter search and rescue course. Clarence House announced the engagement on 16 November 2010. 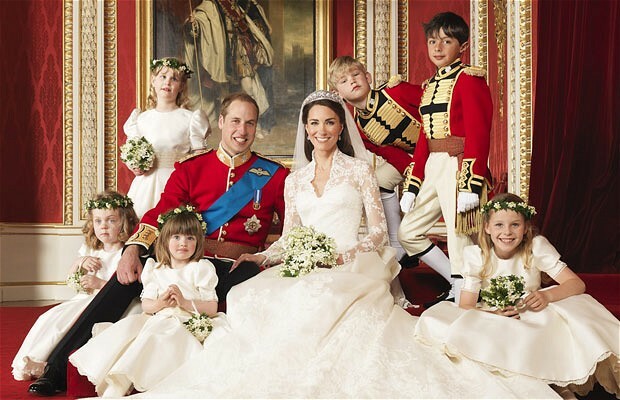 The wedding of Prince William, Duke of Cambridge, and Catherine Middleton took place on 29 April 2011 at Westminster Abbey in London. Prince William, the eldest son of Charles, Prince of Wales, first met Catherine "Kate" Middleton in 2001, when both were studying at the University of St Andrews. Their engagement on 20 October 2010 was announced on 16 November 2010. The build-up to the wedding and the occasion itself attracted much media attention, with the service being broadcast live around the world, and being compared and contrasted in many ways with the 1981 marriage of William's parents, Charles, Prince of Wales and Lady Diana Spencer. Much of the attention focused on Kate Middleton's status as a commoner (i.e. not a part of the aristocracy) marrying into royalty. As Prince William was not the heir apparent to the throne, the wedding was not a full state occasion and many details were left to the couple to decide, such as much of the guest list of about 1,900. It was a public holiday in the United Kingdom and featured many ceremonial aspects, including use of the state carriages and roles for the Foot Guards and Household Cavalry. Hours before the service, the Queen conferred upon William the titles Duke of Cambridge, Earl of Strathearn and Baron Carrickfergus. 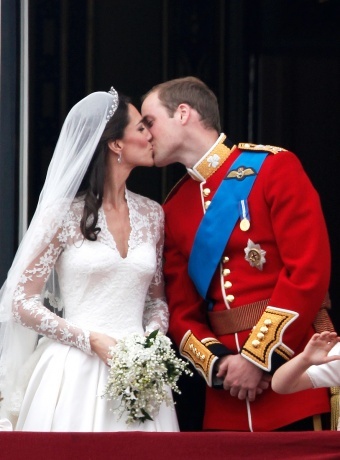 Upon her marriage, Middleton therefore became Her Royal Highness The Duchess of Cambridge. The ceremony was attended by most of the Royal Family, as well as many foreign royals, diplomats, and the couple's chosen personal guests. Middleton wore a white dress by British designer Sarah Burton, as well as a tiara lent to her by the Queen. Prince William wore the uniform of his honorary rank of Colonel of the Irish Guards. William's best man was his brother, Prince Harry, while the bride's sister, Pippa, acted as her maid of honour. The wedding ceremony began at 11:00 am. John Robert Hall, the Dean of Westminster, conducted the service, with Rowan Williams, the Archbishop of Canterbury, conducting the marriage ceremony itself and Richard Chartres, the Bishop of London, giving the sermon. A reading was given by the bride's brother, James. After the ceremony, the newly married couple travelled in procession to Buckingham Palace for the traditional appearance on the balcony and a flypast before crowds assembled in The Mall. Later the Prince drove his Duchess the short distance to Clarence House in his father's classic Aston Martin DB6 Volante, decorated by Prince Harry with a number plate "JU5T WED". Following the wedding, the couple intend to continue living on Anglesey in North Wales, where Prince William is based as an RAF Search and Rescue pilot. Over 5000 street parties were held to mark the Royal wedding throughout the United Kingdom and one million people lined the route between Westminster Abbey and Buckingham Palace. In the United Kingdom TV audiences peaked at 26.3 million viewers with a total of 36.7 million watching part of the coverage. 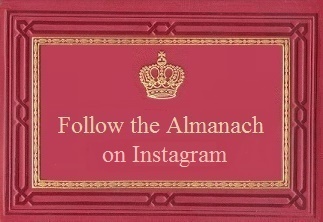 The ceremony was viewed live by tens of millions more around the world including 72 million on the YouTube Royal Channel. 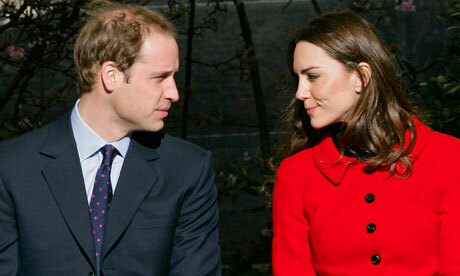 On 3 December 2012, St James's Palace announced that the Duchess was pregnant with her first child. The announcement was made earlier in the pregnancy than is traditional as she had been admitted to King Edward VII's Hospital Sister Agnes suffering from hyperemesis gravidarum and stayed there for three days. On 14 January 2013, St James's Palace announced that the child was due to be born in July 2013, and that the condition of the Duchess was improving. The Duchess was admitted to St Mary's Hospital in London in the early stages of labour on the morning of 22 July 2013, and gave birth to a boy, weighing 8 pounds 6 ounces (3.80 kg), at 16:24 BST that day. 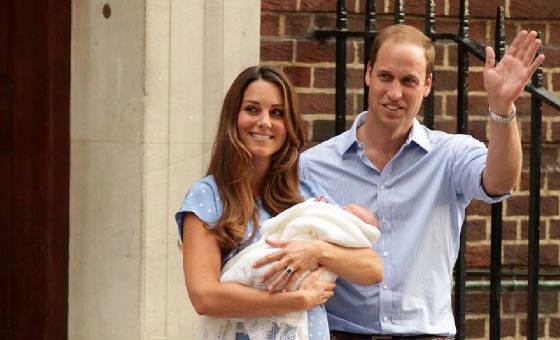 On 24 July, 2013 Kensington Palace revealed that the baby would be named George Alexander Louis. Kate was formally introduced to public life on 24 February 2011, two months before the wedding, when she and Prince William attended a lifeboat naming ceremony in Trearddur, Anglesey, in North Wales. A day later they appeared in St Andrews and launched the university's 600th anniversary celebrations. On 16 February 2011, Clarence House announced that the Duke and Duchess's first royal tour of Canada would take place in July 2011. In May 2011, shortly after the wedding, and while The Prince of Wales was in official visit to the United States, Clarence House announced that the Duke and Duchess would visit California after their Canadian tour. 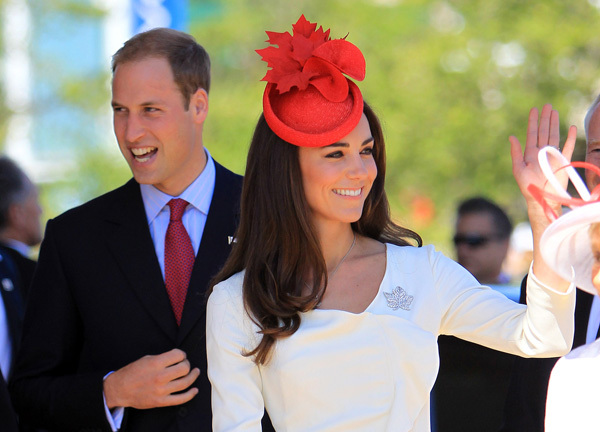 It was the Duchess of Cambridge's first visit to the United States. In June 2011, the Duke and Duchess handed out medals to the members of the Irish Guards. The Duchess visited the Canadian Museum of Civilization to attend a citizenship ceremony, on 1 July 2011 in Gatineau, Canada. The newly married Royal Couple were on the second day of their first joint overseas tour. They were joined by thousands of Canadians taking part in the Canada Day celebrations, which mark Canada's 144th Birthday. On 2 November, the Duke and Duchess of Cambridge visited the UNICEF Supply Division Centre for supplying food to malnourished African children in Copenhagen, Denmark. On St Patrick's day, 17 March 2012, the Duchess carried out the traditional awarding of shamrocks to the Irish Guards at their base in Aldershot; this was her first solo military engagement. The couple is due to visit Malaysia, Singapore, Tuvalu and the Solomon Islands as a part of the Royal Jubilee celebrations in 2012. In addition, she will be a local volunteer leader with the Scout Association in Anglesey, north Wales, her marital home. Unlike the majority of royal brides, and in contrast to most previous consorts-in-waiting for over 350 years, Catherine does not come from a royal or aristocratic background. On the morning of their wedding day on 29 April 2011, at 8:00 am, officials at Buckingham Palaceannounced that in accordance with royal tradition and on recognition of the day by the Queen, Prince William was created Duke of Cambridge, Earl of Strathearn and Baron Carrickfergus. Catherine Middleton has constantly been compared to Lady Diana Spencer, William's mother, because of how she dresses. The Duchess bears the arms of her husband, Prince William, Duke of Cambridge, impaled with her own arms. Catherine's coat of arms is based on those of her father Michael Middleton, which was granted to him by the College of Arms on 19 April 2011. Thomas Woodcock,Garter King of Arms, the senior officer of the College of Arms, helped the family with the design. The dividing line (between two colours) down the centre is a canting of the name 'Middle-ton'. The acorns (from the oak tree) are atraditional symbol of England and a feature of west Berkshire, where the family have lived for 30 years. The three acorns also denote the family's three children. The gold chevron in the centre of the arms is an allusion to Carole Middleton's maiden name of Goldsmith. The two white chevronels (narrow chevrons above and below the gold chevron) symbolise peaks and mountains, and the family's love of the Lake Districtand skiing. 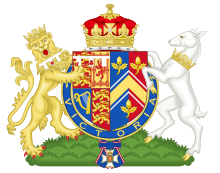 Her previous coat of arms depicted a lozenge shaped shield of arms which hangs from a blue ribbon, this symbolised her unmarried state. This version of the arms is now used only by her sister Pippa as it denotes an unmarried daughter of their father Michael Middleton. In a study of the ancestry of Catherine, William Addams Reitwiesner uncovered that she shares ancestors with her husband Prince William; the closest relationship is via Prince William's mother and Catherine's father through a common descent from Sir Thomas Fairfax and his wife Agnes (or Anne) Gascoigne, daughter of Sir William Gascoigne and his wife, née Lady Margaret Percy. This makes the couple fifteenth cousins. Sir Thomas Fairfax and Agnes Gascoigne are through Catherine's great-grandmother Olive Lupton, daughter of a Leeds cloth merchant Francis Lupton and his wife Harriet (née Davis) - Fairfax being an ancestor of Lupton. 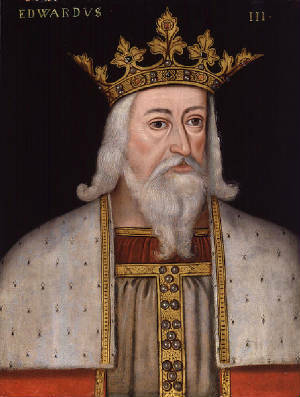 In turn Lady Margaret Percy is descended from Edward III. Middleton's maternal great-great-grandfather John Goldsmith was married to Esther Jones at St John's Hoxton in 1850. On a February 9, 2011 episode of The Ellen DeGeneres Show, Ellen told her studio audience via a letter from the New England Genealogical Society that she is Kate Middleton's 15th cousin via their shared common ancestor Thomas Fairfax.